Our living room is by far my favorite room in our house, and besides the kitchen, it’s the room we spend the most time in. We’ve been slowly adding to it and I’m excited to show our progress so far! 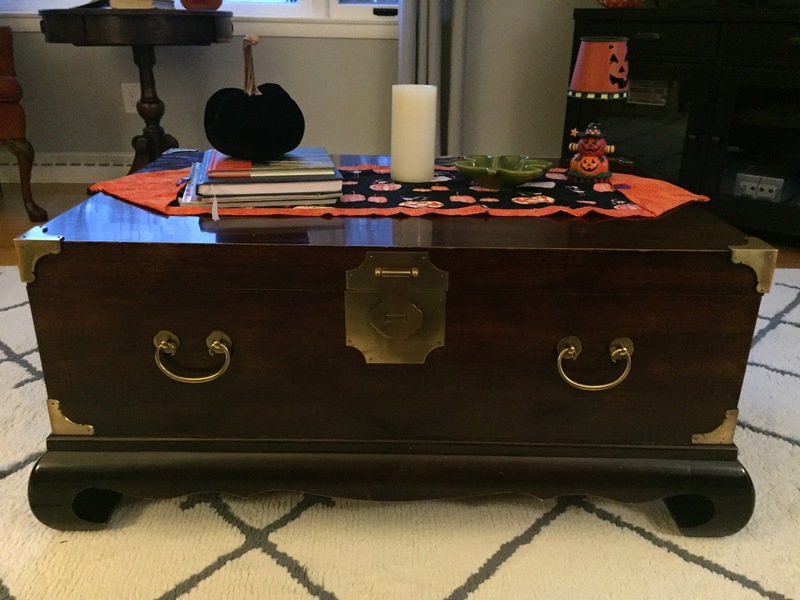 I love unique pieces that have character and have found that the best place to search for these type of items are at flea markets and antique stores. While visiting my family in Chicago this summer, we went to the Kane County Flea Market. My family has been before, but this was my first time, and I was so excited. Five minutes inside and I was in my element. I love looking at all the unique merchandise and the items that some people may think of as being junk, turned into beautiful pieces. I scored two of these cathedral windows at one of the vendors. I was instantly drawn to the restored wood and beautiful metal working. They were going for $15 a piece, but I put my bargaining skills to work and was able to get them for two for $20. When we moved in, we had no entertainment center and were using a side table. We were on the lookout for an appropriate entertainment center but didn’t want to spend a fortune. There is an adorable shop in Houghton, Michigan called Urban Rustics. It is near the town where my husband grew up and I love to stop in there when we are in town to visit his family. It is like a flea market, but in store form. They have a bunch of different vendors set up throughout the store and every vendor is stacked with tons of goodies. I could literally buy every single thing in there, it’s dangerous. Luckily, their items are all reasonably priced. I found this entertainment center tucked into the corner of the basement level. It was surrounded by a bunch of items and if you blinked, you could miss it. Something about it caught my eye. It was such a cute piece that was the perfect size for the area of our living room where we were putting our TV. It also helped that it was priced perfectly at $63.00. This side table also belonged to my grandparents. It was at my parents house forever and I have always admired it. It definitely needs some TLC and I’ve thought painting it, but there is something about the distressed and worn look that I like. For now I’m going to keep it as it is. I absolutely love this coffee table. My cousins graciously gave this to Ben and I when we moved in to our house. This is the perfect spot to store all of our cozy quilts, and the perfect piece to complete our seating area. The orange chair in this picture was given to us by a friend of my moms. We love this chair, and it is my favorite place to be on a Sunday morning with my cup of coffee and a good book. Eventually we are planning to Reupholster it so it matches our other furniture, but for now it works just fine. These are our favorite pieces so far! Our next project is to make a gallery wall behind our couch with photos from our wedding and our honeymoon. We’re so happy with how this room is coming together. Like I said before, this is our main gathering space and it is turning out to be exactly the way we hoped, cozy and welcoming. Next Post Isn’t Nature Neat? Loved the tour and the explanation of how you received the pieces. Good job making your home so warm. Thank you, Mary Lou. Did you see the part about the coffee table? Ben and I love it! Its one of my favorite pieces of furniture from my favorite people 🙂 Can’t wait to see you for Thanksgiving. So Happy for you and Ben. You are doing a great job decorating your new home!